Discover the beauty of light, airy washes in multiple transparent colors to paint multi-colored and white flowers. For light-saturated flowers we will use transparent washes for the lights, clean medium tones and rich darker values to set off those beautiful translucent blooms. 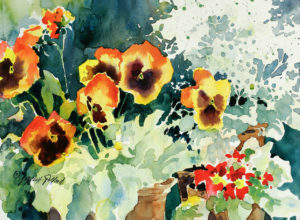 The arrangement of flowers into a pleasing and captivating composition will be studied as equally important to watercolor technique. A photo will be provided, but you are welcome and encouraged to paint from your own reference material as well. There will be demonstrations of techniques suitable for the subject matter, exercises, critique and lots of painting time. All levels are welcome and encouraged to attend. Class time will be structured, yet open enough to accommodate the artistic spirit within us all. The only prerequisite is an attitude of joy in the act of painting!